The orangutan of Borneo is in the twilight of its existence. What is happening in this part of the world is not pleasant, but it is important to know. In 1993, there were still 12,000 Orangutans in the world, today in 2017, the total population of orangutan has halved. The sub-species of Borneo represents about half of these, and scientists predict its disappearance within 10 years. Why ? On this poster, you can observe a Borneo Orang Outang in its natural habitat within a primary forest of Borneo Island. In the bottom right a machete is hidden, as if to symbolize the "machete of Damocles" which weighs today on our friendly Jocko. In the background, a colossal fire ravages its forest. Borneo is the fourth largest island in the world, with a total area of ​​743,000 square kilometers, the size of France + Portugal. Three governments geographically cut the administrative authority which does not simplify things ... Indonesia, Malaysia and Brunei. 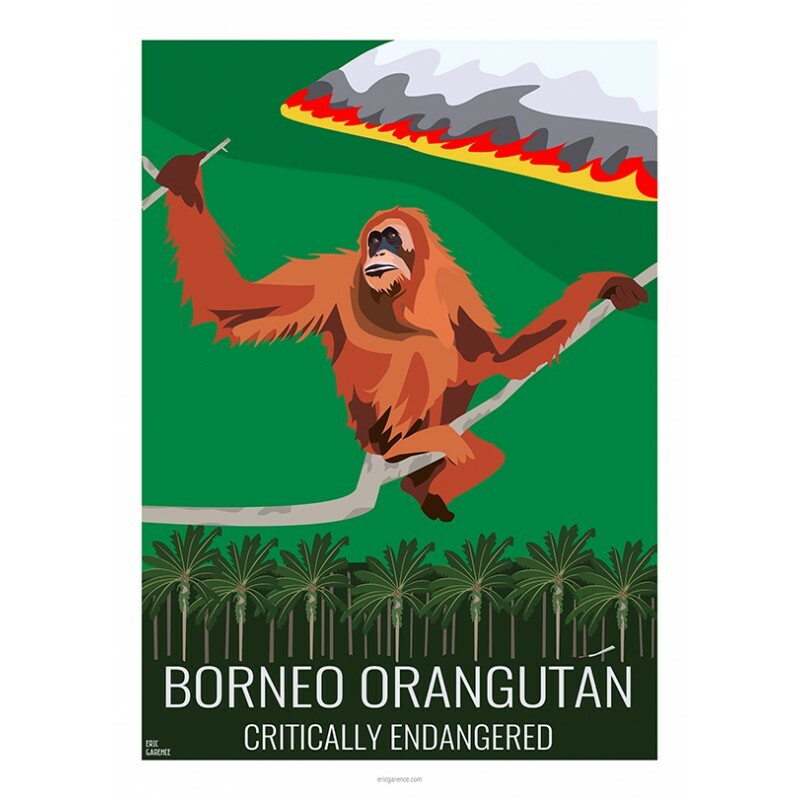 Formerly primitive paradise for a colossal quantity of endemic species, Borneo is victim since the years of gigantic forest fires which ravaged 168,500 square kilometers of primary forest between 1973 and 2010, 5 times the PACA region or 30% of the territory of the La France. So why, in a region like Borneo, located on the strategic trade route between Asia and Europe such fires can last for more than 40 years! ??? Why are none of the 3 states present in Borneo able to stop these fires or to raise public awareness to mobilize international aid? Well, the answer is simple! for it is the inhabitants of Borneo themselves who set fire to their forests; these fires never last more than a few months, the rainy season coming to extinguish fires and allow them to replant ... palms. But beware, it's about palm trees of great value, palm trees that produce palm oil, an oil that is the big substitute for butter in the huge global industrial kitchen. These fires thus allow businessmen and local shareholders of palm oil to earn a lot of money, the Borneo people to earn some money, and we to get our good meals prepared. industrial! While fires poison, make sick, kill people, wildlife and flora, exterminate thousands of animals but nothing compared to the huge benefits generated by the system for a few people! Did you know: In 2016, in nine months the fires in Borneo have emitted as much greenhouse gas as its European German namesake is able to produce in one year! From a health point of view, consuming 300 grams a day of this palm oil is harmful, just as it is harmful to eat 2 platelets of 150 grams of butter a day, the problem is not palm oil but its overuse and especially the way it is grown ... at the expense of all good sense. One last anecdote, that of Pony. Pony is (or was) a female Orang Outang, she was dressed as a woman and offered to the men of Borneo as a prostitute.